In the powerful old hymn "Beneath the Cross of Jesus," we sing "my glory all the cross." That was genuinely true of Jesus. 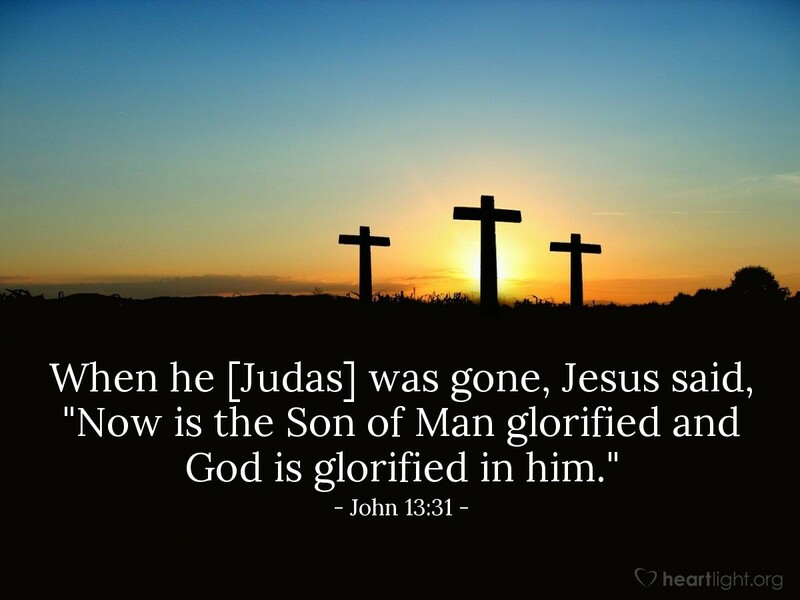 While other human leaders try to find glory in all sorts of ways, Jesus' path to glory was the cross, because he was not after acclaim, but wanted to obey and glorify the Father! When Judas left the Last Supper, the final stages of the process was set in motion that would bring Jesus to the horrors of Calvary. But rather than seeing the cross as his degradation, it was his way of glorifying God. Dear Lord, please forgive me for seeking the approval and recognition of others. Forgive me for being so self-centered. Forgive me for thinking of my glory and not yours. Forgive me when I have trampled on the hearts of others because I was so busy gaining attention for myself. Jesus' example in the last week of his life shocks me back to reality and helps me realize that true greatness is found in serving you, completely, no matter the cost. In Jesus' name, I pray. Amen.